I'm not sure what our kids loved more. The boat ride, being able to run wild through a long cage tunnel or making out with baby orang utans. I know for me it was the making out with baby orang utans. Even Cam got in on the action. Apparently there are only three places in the entire world where you can see orangutans in their natural habitat, one of which is on Orang Utan Island in Bukit Merah, Malaysia. 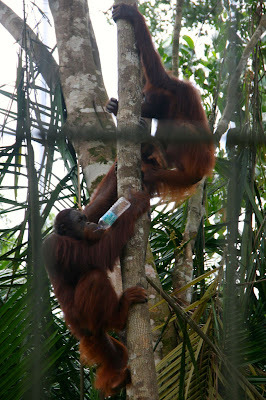 Since we rented a car for our last week in Penang, we decided to check out the orang utans then head to the zoo. About an hour from Penang is a 5 acre island in the middle of a lake. 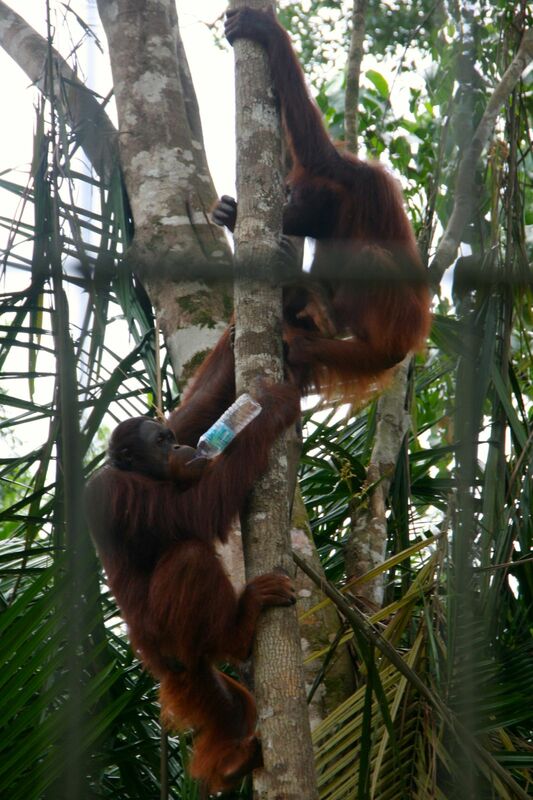 It's billed as the world's first and only rehabilitation and conservation facility where orang utans roam free. The island serves as a breeding sanctuary as well as a conservation, research and education center to better understand this endangered species. We took the 5 minute boat ride across and entered the long cage (think reverse zoo) where the kids proceeded to run wild while we searched for orang utans. There were several hanging around. Even some mommies with their cute babies. The guide threw fruit out for them so they would come closer. It felt wild but not so much. As we headed back we passed the kindergarten area where the babies sometimes hang out. This seems more for show and not the wild experience at all but it was super fun to watch all the kids kissing the glass and trying to hug the Orang Utans. Our kids did not want to leave but eventually we made it back to a boat after missing ours and away we went for the 5 minute ride back. Very glad we were able to see the orang utans in the wild before we went to the zoo.